B Markovic and L Povoledo, Does Asia’s choice of exchange rate regime affect Europe’s exposure to US shocks? Abstract: This paper studies the macroeconomic effects of the transitory Value Added Tax (VAT) cut in the UK using a dynamic general equilibrium approach. The temporary VAT cut policy was announced on 24 November 2008, and was due to come into effect on 1 December 2008, with VAT reverting to its previous level as from 1 January 2010. We quantify the effects of that temporary fiscal stimulus policy on the key aggregate variables of the UK economy and on tax revenues. Overall, we obtain that this policy is too temporary to have important quantitative effects on the economy but qualitative effects are of great interest. We show that the temporary VAT cut will generate an overshooting effect on key macroeconomic variables, and will provoke a significant reduction in investment. Consumption and output will increase during the VAT cut, but they will decrease below their steady state values after VAT reverts to the previous level. Our model economy also predicts that fiscal revenues will decrease about three per cent during the VAT cut. Finally, we find that the VAT cut policy would have provided better results if it had been announced earlier. Abstract: A great deal of research has examined comovements between commercial real estate returns and macroeconomic variables in the US economy. These relationships have attracted less research interest for the UK real estate market, despite this being the largest European Market. This study targets this gap in the literature by investigating the impact of economic and property factors — e.g. the UK IPD all property returns, the FTSE all share index returns, and the term structure of interest rates — on listed property returns. It examines a sample of UK property companies which converted to real estate investment trusts (REITS) following the introduction of the UK legislation permitting this from January 2007. By applying structural time-series modelling and the Kalman filter to obtain unexpected changes or innovations in selected economic and property variables it was found that economic and property variables influence commercial property returns in the UK. Specifically, unexpected changes in the FTSE All Share Index returns, the UK IPD All Property Returns, Industrial Production, the UK IPD All Property Rental Growth, and the UK All Property Equivalent Yield all had a positive impact on property returns. In contrast the term structure of interest rates and the sterling US dollar exchange rate exerted a negative influence. It was also found that by converting property companies into REITS their returns quickly acquired common features of both equities and commercial property backed assets. Abstract: Drawing from recent advances in the classification of exchange rate regimes, this note revisits empirically the relationship between inflation and growth under alternative exchange rate regimes. 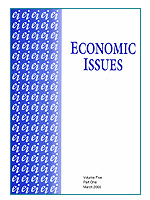 The results, based on a panel of 125 industrialised and developing countries over the period 1980-2004, indicate that the costs of inflation for economic growth are significant only in the case of developing countries, and are higher for floating exchange rates than they are under fixed or intermediate regimes. Abstract: The world market for unbroken yearling Thoroughbred racehorses has exhibited signs of overproduction for some years. This paper explains why, by extending the theory of monopolistic competition to a market for a group of heterogeneous products, ordered by quality, and characterised by perfect price discrimination. The industry demand curve is found to be the marginal revenue curve. The industry supply curve is shown to be downward-sloping and the absence of barriers to entry causes suppliers to continue to produce beyond the point which maximises the social rent. Thus intra-marginal losses are caused by a market failure. step, the entire period 1970-2007 is split into two time frames, 1970-1991 and 1992-2007, in order to take into account the pre and post-Maastricht subperiods. In the second step, two-variable and three-variable panel models are estimated employing the TSLS and GMM techniques. In the third step, we perform a sensitivity analysis by conducting short-and long-run Granger causality tests to check the robustness of TSLS and GMM results. Our empirical findings in the case of EU countries are consistent with the theoretical framework of the fiscal synchronisation hypothesis. Abstract: In this paper we use a stylised three-country model to analyse how the transmission of US shocks to Europe might be affected by Asia's choice of exchange rate regime. We find that if Asia pegs its exchange rate to the dollar, the impact of US shocks on European output and inflation is likely to be bigger than it otherwise would have been. This happens because, without nominal exchange rate flexibility, Asian firms react to the shocks originating in the United States by implementing significant price adjustments, which in turn affect Europe's relative competitive position. On the theoretical side, our results contribute to the literature by suggesting that the shock insulation property of floating exchange rates extends beyond the two countries that have currencies that are free to move. The transmission of shocks between two countries can also be dampened by the choice of floating exchange rates in a third country. On the practical side, our results suggest that, if China did eventually decide to float its currency, Europe's exposure to US shocks would decrease. Abstract: In this paper we analyse whether the apparent comovement of unemployment rates for some of the Central and Eastern EU new members can be explained by a common force, possibly linked to the process of economic integration. For this purpose we test for nonlinear unit roots as a first step to testing for common nonlinearities. Our results show that for five countries, out of eight, unemployment dynamics appear to be well described as a stationary process around highly persistent structural changes. Furthermore, we find evidence of a common nonlinear component driving the unemployment rates. Abstract: This paper extends the literature by developing an objective market based index, which is dynamic and continuous and can be used to measure the monetary policy transparency for a country or, simultaneously, a series of countries. Abstract: This paper adapts the Ethics of Spinoza into the Ramsey growth model and shows that the way people conceive and understand life, related to emotions of joy and sorrow, affects economic performance. The model has multiple equilibria: The Spinoza solution — optimism — leads to greater capital accumulation, income and consumption levels, while William James's solution — pessimism — leads to a worse economic performance. The Ramsey model, where emotions balance, lies in between these two solutions, showing that the neoclassical growth model can be seen as a particular case of the Spinoza model. Finally, regarding the relationship between emotions and economics, in the Spinoza and William James solutions emotions and happiness are determined independently from economic variables. Only in the Ramsey case are emotions explained by income and consumption. Abstract: One of the most striking features of the financial crisis that began in the autumn of 2007 has been the associated upheaval in conventional interest rate spreads. In the UK, this is most frequently symbolised by the widening (and increased volatility) of the spread between 3-month Libor and the Bank of England's policy rate. This paper uses a vector error correction model to look at the way in which the recent crisis has affected a wide range of interest rate spreads. We look for changes in the coefficient on the policy rate (the 'pass-through') and at changes in the speed of adjustment to changes in the policy rate, since both are important for policy. We find, as others have done, that the conventional behaviour of almost all spreads is swept away after August 2007. By developing a model which incorporates measures of counterparty and liquidity risk, we show that market rates are now subject to additional influences but which, except for secured loans, still incorporate the effects of changes in the policy rate much as they did before the crisis. This contrasts with the widely-held view that the relationship between policy and money market rates in particular has been severely disrupted by the crisis. For secured loans, however, there is evidence that the mark-up has risen while at the same time the policy pass-through has fallen since August 2007. The same applies to deposit rates, albeit to a lesser extent, with the result that the sharp reduction in the policy rate since the end of 2007 has had a larger effect on deposit than loan rates, the subject of widespread media comment.